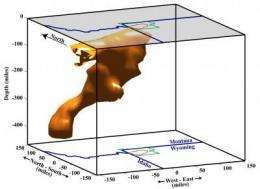 (PhysOrg.com) -- The most detailed seismic images yet published of the plumbing that feeds the Yellowstone supervolcano shows a plume of hot and molten rock rising at an angle from the northwest at a depth of at least 410 miles, contradicting claims that there is no deep plume, only shallow hot rock moving like slowly boiling soup. Some researchers have doubted the existence of a mantle plume feeding Yellowstone, arguing instead that the area's volcanic and hydrothermal features are fed by convection - the boiling-like rising of hot rock and sinking of cooler rock - from relatively shallow depths of only 185 miles to 250 miles. Some 17 million years ago, the Yellowstone hotspot was located beneath the Oregon-Idaho-Nevada border region, feeding a plume of hot and molten rock that produced "caldera" eruptions - the biggest kind of volcanic eruption on Earth. As North America slid southwest over the hotspot, the plume generated more than 140 huge eruptions that produced a chain of giant craters - calderas - extending from the Oregon-Idaho-Nevada border northeast to the current site of Yellowstone National Park, where huge caldera eruptions happened 2.05 million, 1.3 million and 642,000 years ago. A magma reservoir 3.7 miles to 10 miles beneath the Yellowstone caldera. The reservoir is mostly sponge-like hot rock with spaces filled with molten rock. He says the gravity and other data show the magma body "is an elongated structure that looks like a banana with the ends up. It is a lot larger than we thought - I would say about 20 percent [by volume]. This would argue there might be a larger magma source available for a future eruption." The study, the Yellowstone Geodynamics Project, was conducted during 1999-2005. It used an average of 160 temporary and permanent seismic stations - and as many as 200 - to detect waves from some 800 earthquakes, with the stations spaced 10 miles to 22 miles apart - closer than other networks and better able to "see" underground. Some 160 Global Positioning System stations measured crustal movements. 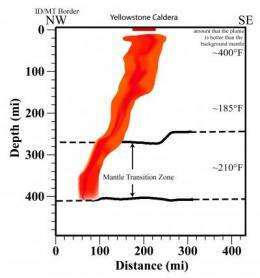 The study also shows warm rock - not as hot as the plume - stretching from Yellowstone southwest under the Snake River Plain, at depths of 20 miles to 60 miles. The rock is still warm from eruptions before the hotspot reached Yellowstone. That is the base of the global transition zone - from 250 miles to 410 miles deep - that is the boundary between the upper and lower mantle - the layers below Earth's crust. The notion that a deep plume feeds Yellowstone got more support from a study published this month indicating that the Hawaiian hotspot - which created the Hawaiian Islands - is fed by a plume that extends downward at least 930 miles, tilting southeast. Smith conducted the seismic study with six University of Utah present or former geophysicists - former postdoctoral researchers Michael Jordan, of SINTEF Petroleum Research in Norway, and Stephan Husen, of the Swiss Federal Institute of Technology; postdoc Christine Puskas; Ph.D. student Jamie Farrell; and former Ph.D. students Gregory Waite, now at Michigan Technological University, and Wu-Lung Chang, of National Central University in Taiwan. Other co-authors were Bernhard Steinberger of the Geological Survey of Norway and Richard O'Connell of Harvard University. This is mind blowing, it's amazing how large and beastly that plume is, and for the longest time our only understanding of it was that tiny tip at the surface ... and that tiny tip was huge to us! It's not often I'm drawn in to geology, but this is absurd. I recently watched a documentary which described one of the reasons for some larger extinctions on record was due to this furious beast exploding. Makes me wonder, should we prematurely cause super volcanoes like this to release energy from building pressure on some regular interval? ... to protect our long term interests from cataclysmic destruction. Maybe we should drill deep holes in to these systems somehow, or would that make the situation worse? Better yet, we should convert yellowstone in to a geothermal power system, I know we'd destroy some beautiful landscapes, but beautiful things can become quite furious... and especially dangerous. The composition of the magma is different from more "calm" volcanic systems, such as the Hawaian hot spot, this is why the system erupts cataclysmically. I suppose it would not be feasible to inject enough matter to alter the properties of the magma, but cooling would slow down the upwelling. Iceland is doing research on really deep geothermal power drilling, but the credit crunch has probably slowed down the work. Yes, yes, very interesting, but do you think it might also have been interesting for your readers to have maybe at least asked the authors of this work "Will it erupt soon and will that eruption spell the end of the human race?" ?! Now, will it continue to smear sideways, or break away and create a new surface feature ?? Like Hawaii the hot spot doesn't move, the surface does, it will continue to "smear sideways" as you put it. As it does the old geological surface spot will move father out from over the hotspot and eventually break away and cease to be active (once it's too far from the hot spot to be fueled by it anymore), it will fade away with time (much like the tailing Hawaiian islands) probably leaving some pretty cool underground caves. When the plume is "cut off" by the shear, as is guaranteed eventually, it will push up anew until it has another catastrophic eruption I imagine, then forming your new surface feature. In other words, if that thin spot in the image of the plume starts to develop a new hump upstream, more directly over the origin of the plume, that's probably when we'll have to start worrying about a new eruption, ya know in a few hundred thousand years or so. You can see the historic "path" of the hot spot on a topographical map I think...it basically swept in a smile-like shape (a flattened u) through southern Idaho (perhaps roughly I-84 into I-86 then north-east), if the crust keeps going on that trajectory, Yellowstone will gradually move into southern Montanta I suppose, creating new surface features as it goes, the old ones fading away. I have also been thinking about using the yellowstone magma chamber as a powersource. Cooling the magma down should lower the chance of eruptions unless we weaken the crust too much. So I did a back of the envelope calculation. According to the USGS the volume of the magma chamber is 15.000 cubic kilometers. Assuming a density of 2500kg/m3 and specific heat of 1kJ/kg/K. To lower the temperature by 1 degree we would have to extract almost 4x10^19J. That's approx. 1250GW of thermal power for 1 year. At 35-40% efficiency that would yield 400-500GW electric. But since the magma chamber is still fed from the plume we should be able to extract energy at this level for hundreds of years. Just need to avoid triggering an eruption. The concept of releasing pressure of a volcanic upwell sounds helpful, it might not be. I am no geologist but I seem to recall that the properties of magma is partially dependant on its pressure. At the mantle, material is almost solid dispite high temperature. As a part of the crust thins, like where plates are separating, the decompression causes some of the mantle to liquify and produce volcanos. While magma extrusions are already fairly liquid clompared to surounding material, lowering the pressure could make it less viscous and able to force itself to the surface and disolved gasses could bubble out like a shaken pop bottle when opened. I'm not saying it deffinately should not be tried, but I would want to learn a lot more and maybe try it on a smaller, more issolated system first. The idea that we could avert an eruption is as absurd as the idea that we can change the weather. These forces are so beyond the scope of humanity, that nothing we could do would have even the slightest effect on them. Although geothermal energy should be a no-brainer. StillWind, comparing the two is absurd. We're talking about an underground pressure building over millions of years, and that's pressure being applied over a broad area. If all of that energy were exerted in a single spot, which it isn't, it would already have broken through. We can't control the explosion, we can't control the inevitability of it, we can't stop the earth from doing it's thing, but we can drill a damn hole and use explosives to prematurely provoke the volcano at a point where it would have a far less severe impact on our society. Why is it so hard for people to think. It's like you convinced yourself it's impossible, based on no actual reasoning or thought other than 'just because, it's big man... so big, so out of control maaannn'. We can in fact change the distribution of gases in our atmosphere. We ARE COMPLETELY capable of AFFECTING SOME change. We should apply the most effective action we can, in a critical way. Yellowstone National Park, where huge caldera eruptions happened 2.05 million, 1.3 million and 642,000 years ago. By my calculations the time between the first and second eruptions was 750,000 years, between the second and third was 658,000 years. Since it's been 642,000 years since the last explosion I'd say we're in the ballpark for fireworks in the near future geologically speaking. frajo; We can let it blast with all its might and cover 1/2 of our nation in destruction, or maybe we can get away with only 1/3-1/4 of our nation being destroyed. The affects are going to be massive, the 10-20% we can salvage will be worth it. Then again, judging by how close we are to the next explosion it might already be too late anyway. It seems insane to care now because nothing is happening, but maybe we should already be moving our farm lands in preparation for the next few thousand years. We have the tools and data to know in advance about how close we are to the catastrophe, we'd be idiots to ignore it and do nothing at all. Because we as individuals exist for 3/4 of a century at a time shouldn't justify being irresponsible for the future of our species. Screw it, you guys can be r-tards, I'll just move to some other continent and breed there, hoping to sow my future clones in a more secure place. It seems to me that every time man attempts to avert a disaster, he creates a larger one. The problem with tapping off the available heat is this- if you inject water into or near the plume, the heat uptake can cool the rock in the area enough to cause fracturing. this in turn, reduces the pressure(on the order of many thousands of atmospheres)on the adjacent material, which could lead to further liquefaction, and FORCEFUL injection into the fractured surrounding rock, with highly unpredictable results, which could, conceiveably lead to an eruption. Same problem with trying to drill "relief" wells, or whatever- this material is under immensely more pressure than say, an oil field. The heat in this magma has come from radioactive decay of elements deep in the Earth. The heat is trapped by the bulk of the earth and thermodynamically must seek a state of equilibrium through conduction of convection to cooler areas. Here we see a convection process. It would not be beyond the wit of future generations to see this flow of heat as a natural resource and harvest it near the surface. Perhaps a grid of geothermal stations over the whole area extracting heat in a slow controlled way so as not to open any sudden release of pressure.